Tree bracing is one form of mature tree preservation. Tree preservation includes tree bracing, tree cabling, bolting, water proofing, and treatment for insects. Tree bracing provides rigid support for a tree. It is common to use cabling in combination with tree bracing. Before using tree bracing, the Arborists with Canopy Tree Service will want to assess the tree to make sure that the tree is not hazardous. Tree bracing can lend support to a tree by limiting movement of the limbs but if the limbs are decayed, the tree may be better off removed. Tree braces doe not have to be ugly. A natural looking tree brace can be made of a cedar post. The cedar post can be cut with a chain saw to create a seat for the tree to rest in. When a limb that requires bracing is too high for a cedar post, we typically use a drill pipe that can be custom-fitted to the tree with the help of a welder. Another alternative is to use tree cables along with a Stimson post. One end of the tree cable is attached to a hook at the top of the Stimson post. The other end is attached to the limb we wish to support. One advantage of this system is that multiple branches may be supported by this post. 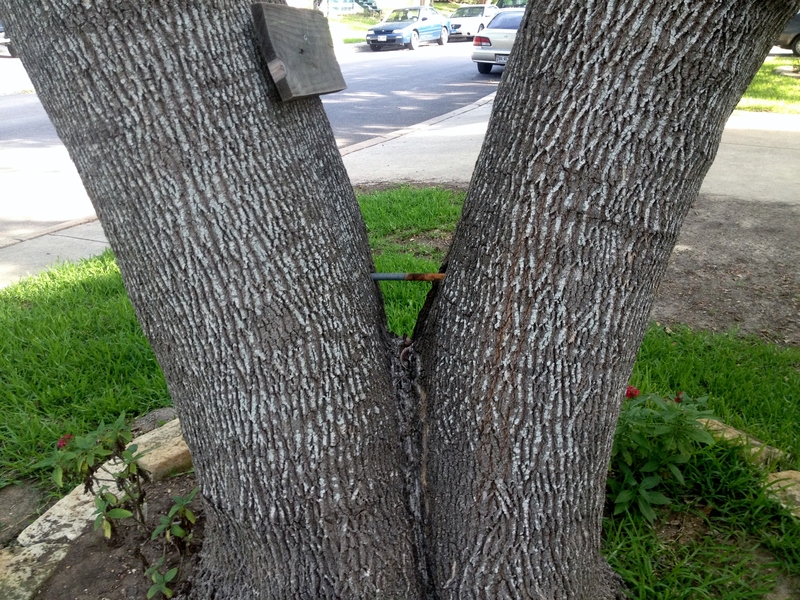 One use of tree bracing is the situation where you have two tree limbs rubbing together. The two limbs can be bolted together to prevent them from rubbing the live tissue off of each other. A Texas A&M University article provides additional descriptions on the uses of tree bracing. Canopy Tree Service is often consulted when a home owner has a stemmed tree with a “V-crotch” or when a tree has an unusually large horizontal limb. Proper bracing and tree cabling requires knowledge of where to locate the cable in proportion to the limb length, how tight to stretch the attachments, and the selection of the proper equipment for the job. Young trees are often times staked to give a newly planted tree time for the roots to become established. Materials for this job are usually available at a garden center. Although it is common for homeowners to brace newly planted young trees until they get established, do-it-yourself tree bracing on mature trees is not recommended. Hazardous trees are not good candidates for bracing and the tree health of a mature tree should be evaluated by an arborist before bracing is considered.